Now that I'm in the blogging mill again, even though with a slower speed of the wheel, there will be this new feature where I share a wild assortment of bookish stuff with you. Let's think of it like a newspaper where you get all kinds of news, just more bookish, and a tad shorter. 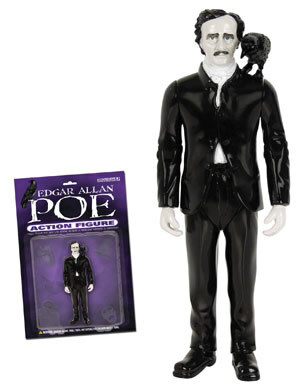 Shakespeare's Den ... if you're looking for the largest selection of Shakespeare gifts and theater gifts your search is now officially over. 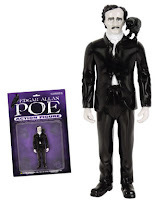 Maybe I should actually read one of his plays first *gasp* but who needs good old Shaky anyway, when you can get your own personal Edgar Allan Poe Action Figure instead? If you looked down to the bottom of my soul, you would understand fully the source of my longing and – pity me. Even the open, transparent lake has its unknown depths, which no divers know. Creativity Portal ... this is a place that inspires creativity through personal expression and the arts. No matter what kind of creative juices flow through your veins, you'll be sure to find fuel for your creative mind. If not, then you might want to get started by reading 101 Tips on How to Become More Creative to ignite that spark again. This reminds me ... I am in a book club, and I haven't even started on the May book yet and we meet in a couple weeks! EEK! You won my blog giveaway for the ladaisi illustration dreamcatcher! I emailed you about it a week or two ago but I think the mail must've gotten lost. Anyway, congratulations! And please send me an addy so I can ship it to you! Cheers! Thanks so much for contacting me - I just e-mailed you back!